This is the best (tastiest) and healthiest mayonnaise recipe you will ever find. It could be called a Mock Miracle Whip® recipe except that it is sweeter and tangier. 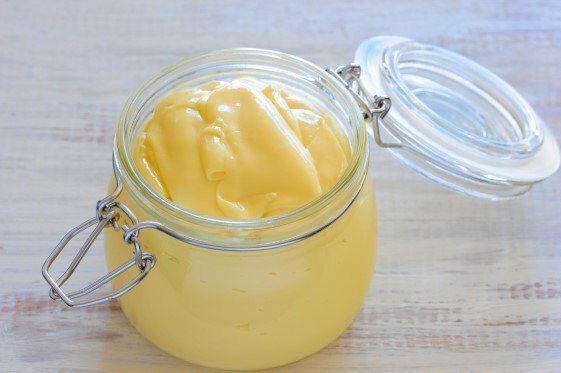 If you don’t like the sweet and tangy and want to just make plain mayonnaise, you can remove the sweetener and some of the lemon juice/vinegar. We will discuss what makes this recipe so damn good for you as you get into the recipe. Again, if you prefer regular mayo to the tangy Miracle Whip® taste, simply cut the vinegar and lemon juice (how much is up to your taste buds) and eliminate the sweetener. First you’ll want to set the eggs out for about 30 minutes to warm them to room temp. Make sure your eggs are farm fresh and organic. Personally, I would never eat a factory farm egg raw. Next you’ll want to mix together all the goodies that will go into your recipe once the eggs and oil have created a thick base. Immersion Blenders: Every kitchen needs one of these. Our latest affiliate program (as of Jan 2019) is “Chef ‘s Catalog.” And if you know anything about us, you’ll know that we do not choose our affiliate programs on the basis of how much we can make, but on the basis of who has the highest quality products. We recommend only those things we buy and we use, because integrity is the most important draw for our readership. Chef’s Catalog has some fine, sturdy, handy gadgets for kitchens. 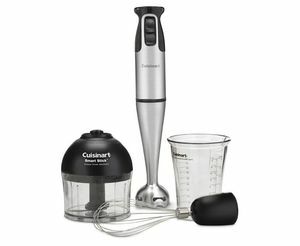 Here is a medium priced immersion blender (hand blender) with a few attachments: Cuisinart 2 Speed Hand Blender. Find a small bowl with tall sides (you’ll be using your immersion blender) , mix well all the other ingredients in the second part of the recipe (above) except for the Konjac Flour. Konjac Flour: Every kitchen needs konjac flour. Again, it is available from one of our affiliate programs, the Miracle Noodle people. I always have two bottles of it in my kitchen. Our website focuses on health, but people don’t eat health foods unless they taste good. You know this, and we know this. And the fewer calories we add to our recipes, the healthier they are. There’s nothing worse than making a tasty gravy or sauce and then thickening it with 100 to 200 calories of flour. Konjac flour has ZERO calories, and it thickens without heat. So this recipe is both tasty and lower in calories than any mayo on the market. My first experience with konjac flour was while I was preparing a stir fry. I always prepare my spices separately, and then I’d take my flour and water combination (used to thicken the sauce) and shake it up in a container and set it aside. I performed my usual routine with the spices, only this time I used konjac flour and water in a small container, shook it well and set it aside. When it came time to add the thickening agent, I took the top off the container with the konjac/water mixture, and to my surprise, it had completely hardened. I slapped it on the counter and something resembling a breast implant sat there staring at me. I wet the bottom of it and stuck in on my wall, and that thing stayed there for nearly a month. So I learned right away that konjac flour thickens without heat. It thickens quickly, so, for this reason, we add it to nothing except when everything else is completed, and then we mix thoroughly. Use your immersion blender on the second part of your recipe without adding the konjac flour, and put it aside. Now we will make the base; a nice thick base. In a mixing bowl, with the mixer on high, add the egg yolks and start whipping. Add your MCT Oil just a few drops at a time (or a very thin drizzle) at first to make sure you’re getting enough air into the mixture. Add the oil very, very slowly. You should notice that the concoction starts to stiffen as the designs created by the whirring mixer begin to stay longer and longer. You can add the oil a bit faster as this concoction stiffens. Note on Mixers: I used to buy whatever was on sale at the big big store in town, but I found that I was buying one every year or so, because they just burned out. Get a good mixer. The one I have now is 7 years old and still going strong. Here are some very good mixers that will last a long time: Mixers at Chef’s Catalog. Note on MCT Oils: We use a Medium Chain Triglyceride oil because it is anti-inflammatory and because our fat cells reject it. MCT oils give us extra energy and must be burned off like carbs. You can read more about them here: MCT Oils (Medium Chain Triglycerides). And please note that you can get the best at the best price from Simply the Best. I personally helped them get a version that is extracted entirely from Coconut Oil, because Palm Oil is not harvested sustainably, which is destroying the habitats of many endangered species. And we always suggest purchasing from Simply the Best because 1. they treat their customers very special, and 2. they are a non-profit, and what they have left over after paying their bills goes to charities (like animal rescue shelters and even to our charity). Now you have a thick yolk colored substance in the mixing bowl, and you have the second part (without the konjac flour) in another bowl. It’s time to add the konjac flour to the second part. Once added, you want to thoroughly blend with your hand/immersion blender. And I mean thoroughly. Konjac flour will clump. Once blended nicely, you will slowly add it to your concoction in the mixer, mixing thoroughly, using a spatula to make sure everything on the bottom of your mixing bowl gets into the mixture. Warning: It will get very, very watery. Do not worry. Your konjac flour will turn it back into the consistency of mayonnaise once refrigerated. If you use too much konjac flour, it will turn it into the consistency of spackle, and you can use it to finish off the walls in the kids’ room. Again, this is a warning. It can get very thick. As an experiment one day, we added one half cup of Coconut Milk Powder to the recipe. It turned out so good that we will NEVER make mayo again without this. It just made the mayo amazing. In place of a tablespoon or two of vinegar, get a tablespoon of kimchi juice, or juice from a good sauerkraut and stir that in. Let it sit in the kitchen for about 7 hours, then refrigerate. Another method is to open some capsules of probiotics and spread the contents throughout the mayo and then let that sit. This is a great way to keep your gut in balance. We call this a Guilt-Free Mayonnaise. And it is. The greatest number of carbs in it come from the Coconut Milk Powder, and coconut milk is just so good for us. The fats (MCT oils) have calories, but they are burned off much differently from other fats. You can experiment with other oils. Add a bit of flax oil, or hemp oil; this is totally up to you. We have made this with macadamia nut oil and it’s very tasty, but since switching to MCT oils, we’ve never gone back. And don’t forget about Simply the Best. It’s one of the few non-profit stores you’ll ever find, and it’s stocked only with those things we’ve discovered in our research. Whenever we posted a recipe, we got email from folks who couldn’t find certain ingredients at their local stores, so Simply the Best is now there for them (and you), providing Swerve Confectionery Sweetener, MCT Oils, Celtic Sea Salt, and Coconut Milk Powder for this recipe and for others at this site. You’ll love their service and the freebies they stuff your packages with. I should know. The handicapped fellow they originally hired to do shipping embezzled $3,000.00, and so they conscripted me for the job, and now I’m doing the work of 9 people instead of 8.